Home » Dudhsagar Falls » Goa » Goa bike rent » Goa honeymoon package » Goa in Monsoon » Goa shacks » Kulem » Kulem railway station » Panaji » Sonaulim railway station » GOA in Monsoon – NOT a good idea? Think AGAIN!! GOA in Monsoon – NOT a good idea? Think AGAIN!! Do you have the impression that Goa is all about beaches, parties and booze? Well in that case you will be amazed to see the second face of it – Goa in Monsoons! Monsoon is the time which is generally regarded as off-season in the context of visiting Goa. Water sports are shut down, one is not allowed to swim deep into the sea and, moreover, almost no beach parties are arranged during monsoon season. But then for the traveller inside me this is the best time to explore the virgin places. 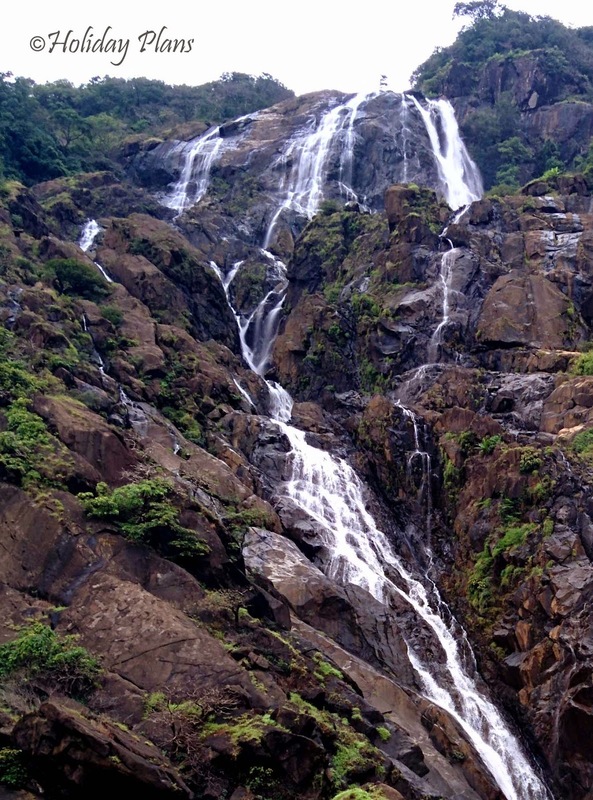 “Dudhsagar Falls”, meaning Sea of Milk, situated on Goa-Karnataka border is one of the hidden gems of Goa. The place got little fame through Shahrukh-Deepika blockbuster “Chennai Express”. Yet it is one of the “least” visited waterfalls in the country and probably more beautiful than the famous ones. Government/private taxi operators operate taxis/jeeps from Kulem throughout the year EXCEPT the monsoon season. But there is no time other than monsoon to see the falls in their full fury. I did my homework well on how to visit the falls especially in monsoons. So, we three friends started our journey from Panaji early morning and drove all the way to Kulem railway station. It was raining and we witnessed the very best of nature throughout the route! It filled me with great excitement and joy as I grew more and more tempted towards my upcoming adventure. Dudhsagar do have a railway station but no ticket booking is allowed for it. Most of the trains going from Goa to Karnataka or coming from Karnataka have a halt of 2 minutes at this station to check for the brakes. One such train is Amravati Express. It leaves at 9AM from Kulem and takes half an hour to reach Dudhsagar. We were just in time at Kulem station to take the train. The train route from Kulem upto the falls is sloppy and full of tunnels which leak water. The area comes under the reserved forest area. Since it was monsoon and rain was coming down in bits, the view of the forest area and the nature was giving me with the impression which was poles apart from the “typical” Goa experience anyone can ever have! After Sonaulim railway station there is a view point from where imposing 600m tall falls can be seen. Even a short glimpse of the falls is awe-inspiring in itself; its name “sea of milk” being completely justified! We reached the station which is a bit ahead relative to the falls; hence had to walk back roughly a km and cross a tunnel. Trekking on the railway track in the wild and that too crossing a railway tunnel which was dripping water was an experience that can give an adrenaline rush to even the toughest! One has to be careful of the coming trains as the tunnels are narrow and slippery. Finally we came to our objective - Dudhsagar Falls and the beauty of the falls was such that we sat there for hours without moving and doing nothing! The excitement and anxiety was rewarded with a view which made the reality hard to believe. The railway bridge is positioned such that from a distance it feels like the train would pass cutting the flow of the falls. As they say “A picture says a thousand words”, attaching some pictures will help understand the reason behind those emotions. There is a hut where local sellers do prepare fresh tea, omelette etc. Also chips and drinks are available there. We had our breakfast from there. By that time it had again started pouring, this time more ceaseless and a bit thunderous. We decided to move back to Kulem station. Now we had two options - to trek back 12 kms on the railway track (which seemed impossible considering the energy level) or to request one of the goods train driver/guard passing by the falls to drop us till Kulem. Luckily we did succeed in convincing the driver and rode back to Kulem in the ENGINE of the train! Again an experience which I had never thought of! It nearly took us 10 hours to complete our adventure of Dudhsagar Falls starting from Panaji; an experience which was more than a worthwhile one. All the adrenaline rushes and uncertainties made the whole journey a memorable one and whenever that very sight of Dudhsagar falls will come to my mind, I will certainly pause for a moment and spare a moment to that part of my memory. My tryst with Goa in Monsoons did start on a very satisfying note. My anxiety level reached a whole new level. We will visit the centuries old churches and go on a river cruise in the next article! Till then keep calm and enjoy the monsoons! What a Feel "GOA IN MONSOONS"..
Nice post! I lived in Goa for a year and to my surprise, I never even heard about it. I guess I need to visit Goa again, that too in monsoons! After reading your article goa really needs a visit and that too in monsoon. As beautifully described as Goa itself is. Goa is really a tranquilizer in itself. Goa is like a rainbow, having each color for every season.